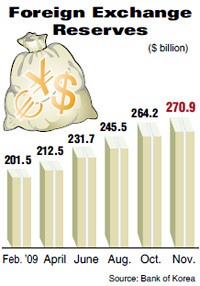 Currency Reserves Hit Record High of $271 Bil. Korea's foreign exchange reserves for November exceeded $270 billion for the first time in history, with the weakening dollar boosting the value of the nation's assets denominated in other foreign currencies. Additionally, the continued current account surplus and the government's buying of dollars contributed to raising the currency reserves to an all-time high. The Bank of Korea (BOK) said Wednesday that the country held $270.9 billion in its reserves in November, up $6.7 billion from October. This is the highest level since the central bank began compiling the data in 1950. The previous high was $264.3 billion in March 2008. The reserves have been rising for nine consecutive months, with a total gain of $69.4 billion. Foreign reserves consist of securities and deposits denominated in overseas currencies, along with International Monetary Fund reserve positions, special drawing rights and gold bullion. The strengthening of the euro and the pound increased the value of the reserves in dollar terms. Also, the Ministry of Strategy and Finance retrieved about $500 million in maturing dollar funds extended to local banks last year in the aftermath of the global financial crisis, while the central bank collected $700 million from the National Pension Service in accordance with a currency swap arrangement between the two. "Our growing reserves will better cushion the nation from future external shocks, similar to the collapse of Lehman Brothers and Dubai's debt problem. We expect the reserves to head upward for the foreseeable future. But it really depends on the future value of the dollar," a BOK official said. Good Morning Shinhan Securities chief economist Lee Sung-kwon projected the reserves will continue to increase for the time being on the globally weak dollar. "The United States wants to keep the dollar weak against the yen and other currencies to bolster exports in a bid to pull itself out of the slump as its domestic consumption and investment remain sluggish. The weak dollar will increase the value of assets denominated in the yen, euro and other currencies." Lee then said Korea's outbound shipments would continue to grow as more foreign investors buy local shares and stocks, putting upward pressure on the Korean currency. "To rein in the won's rise, the government will likely intervene in the currency market to buy dollars, which will further boost the country's currency reserves," Lee said. As of October, Korea was the sixth-largest foreign exchange reserve holder in the world after China ($2.27 trillion), Japan ($1.06 trillion), Russia, Taiwan and India.